The Public Enquiry (Appeal Hearing) for the planning application for development on the airfield (15/04004/OUT) will reconvene on 18 December. The Enquiry got underway as scheduled on Tuesday 9 October in front of the presiding Inspector, Frances Mahoney, and continued through the rest of the week. It resumed on the following Tuesday but was adjourned on Thursday after 7 days of activity. The Inspector has arranged to reconvene on 18 December for 2 days to complete all the necessary activities. During the first day third-parties were given the opportunity to provide evidence. Those who spoke included representatives of gun clubs that used the historic gun butts on the airfield. Concerns were raised about the continued use of the butts if development were to go ahead. In addition, a resident from Ford (Ron Champion) and WCllr Ian McLennan stated their reasons for objecting to the Planning Application, and a Parish Councillor (Vic Bussereau) explained the Council’s reasons for objecting. Click here to see his objections. 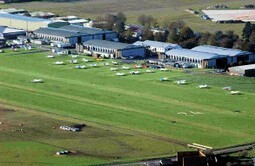 Most of the remaining days were taken up by evidence from expert witnesses provided by both Wiltshire Council and the prospective developers, Old Sarum Airfield Ltd. One session took the form of a ‘round table’ discussion chaired by the Inspector in which third-parties could participate and did! Evidence at the hearing was also given by Mr Grenville Hodge, Director of Old Sarum Airfield Ltd, on behalf of the company and the Owners. The Enquiry will resume on 18 December for 2 days at the Red Lion in Salisbury and will include the detailed summing up by legal representatives on behalf of Wiltshire Council and Old Sarum Airfield Ltd. A site visit by the Inspector will also take place, possibly on 20 December if it cannot be accommodated within the 2 days. Timings for the restart will be published shortly. The Inspector’s decision on the Appeal is not expected for several months after the completed of the Enquiry. A Public Enquiry (Appeal Hearing) for the planning application for development on the airfield (15/04004/OUT) will commence on 9 October. The appeal hearing will be held on Tuesday 9 October 2018 at 10am at Alamein Suite, City Hall Salisbury and is scheduled to last 8 days, excluding Monday 15 October. It will be attended by Wiltshire Council (who will be defending their view that the application is unacceptable), the appellant and the presiding Inspector. Members of the public may attend and at the discretion of the Inspector take part in the discussion. An extract from the Strategic Planning Committee minutes relating to this Planning Application can be viewed here. Their reasons for refusal are here. Wiltshire Council Strategic Planning Committee meeting on 31 January. Committee state that planning application for development on the airfield (15/04004/OUT) ‘unacceptable’. RECOMMENDATION: That the Planning Inspectorate be advised that the Council would have REFUSED the scheme. In other words, Wiltshire Council has agreed that they will fight the case for refusing the Application when a public appeal hearing is heard in front of an Inspector. Vic Bussereau spoke as a representative of the Parish Council with Ron Champion and Graham Renshaw speaking as residents; all 3 spoke against the Application. 30 plus residents travelled to Trowbridge to attend the Committee meeting. WCllr Ian McLennan, who is not on the Committee, spoke as the Unitary Cllr for the area, making an impassioned speech containing some excellent points. Nobody spoke in support of the Application; the only representative present from the applicant was the Airfield Manager who did not speak. The Committee debated the issue. All who spoke supported the recommendation. At the final vote there was one abstention with all remaining members supporting the Officers’ recommendation. A date has yet to be published for the public hearing which should be held at a venue in the local area. Planning Appeal and meeting of the Wiltshire Council Strategic Planning Committee to be held at the Council Chamber, County Hall, Trowbridge on 31 January at 10.30am. The applicant has made an appeal to the Planning Inspectorate for lack of determination of the planning application for the development on the airfield (15/04004/OUT). At this point in time, no date or venue for the subsequent Public Inquiry has been set. In the meantime, the Wiltshire Council Strategic Planning Committee will meet on 31 January to consider an officer report and a presentation given at the meeting. The Committee will decide what action the Council should take on the appeal. Laverstock & Ford Parish Council will be represented at the meeting. The meeting is open to members of the public to attend. It is believed that a number of residents from the parish are intending to attend the meeting. Problems currently with submitting consultation responses to revised plans on Wiltshire Council planning website. At this moment in time it is not possible to post responses onto the planning website because this is still showing the consultation expiry date as 31 May. This problem has been flagged up to the Wiltshire Council and it is hoped that the date will be changed to reflect 9 Jun (the correct date as confirmed by the Case Officer) during Monday 6 Jun which will overcome the problem. In the meantime, it is possible for views to be submitted by email to (developmentmanagement@wiltshire.gov.uk) or by letter post. Is important that if a response is an objection to the planning application, this should be stated clearly in the first line. The Parish Council and residents meet for wash-up meeting following meeting with Barton Willmore on 13 May. Following on from the meeting of with Barton Willmore on 13 May, the Cllrs and residents who attended held a wash-up meeting on 27 May. There was general agreement that the changes proposed with the revised plans submitted in May this year were minor as far as the local community was concerned. Several points were raised which required clarification and these were to be send to Barton Willmore. Aspects noted from the 4 hand-outs provided by Barton Willmore included lack of information on Airfield Viability and Economics as the hand-out on this contained no evidence to support some of the statements made which were difficult to believe. (The PC understands that Wiltshire Council has more detailed information which is being reviewed by a financial specialist). In addition, the Land Use Summary and the associated map were felt to be misleading with regards to the density level for the proposed development. One of the 9 documents suggests a determination date for the application of 1 Jul; however, the PC believes that this date is not achievable. It was noted that since the 13 May meeting, a number of residents had queried whether, in view of the 9 new documents on the Wiltshire Council planning website for Planning Application 15/04004/OUT, responses submitted in 2015 based on the original application documents would still be considered. The answer from Wiltshire Council is a very positive YES. Residents are recommended to submit further responses which relate to these 9 documents (and indeed the 4 hand-outs provided at the 13 May meeting which can be found below). The largest of the new documents, the Supplementary Environmental Statement, encapsulates all the changes; however, other memos relate to specifically to ecology, noise (aircraft and the shooting range), air quality, additional traffic on the A345 and local traffic issues around both the Portway and Ford. As at the date of this entry, 38 additional responses have been placed on the Wiltshire Council planning website since the 9 new documents were included. The PC believes that efficacy of many of the changes suggested and the statements made are very questionable. A reduction of only 16 dwellings from the original 480 proposed, does nothing to change the fact that what is proposed is massive over development in a conservation area which is based on an historic 99 year old WW1 airfield. The PC will be providing a formal response based on these 9 documents and the 4 hand-outs; this will be in addition to the 2 consultation responses already provided by the PC in 2015. The reasons for Wiltshire Council refusing a recent planning application for the old Squash Courts at Old Sarum (16/02069/FUL) make interesting reading. Two L&F Cllrs attended the Flying Forum at Old Sarum Airfield on 23 May 2016. The Flying Forum should be held approximately every 6 months with the object of reviewing any noise complaints; however, no meeting had been held since Jun 2015.The meeting is chaired by WCllr Mary Douglas who is the Unitary Cllr for St Francis and Stratford. A list of complaints, which contained limited information, was submitted at the meeting. The main issue was helicopter operations as these had resulted in numerous noise complaints from a variety of locations within Salisbury. The airfield management believe that they operations within the usage of the Airfield and operations on the airfield have been witnessed by the CAA who is content with what they saw. The airfield, it was stated, was losing approximately £70,000 a year and the current helicopter training package reduces the losses by about 1/3rd. The management indicated that they had been keeping movements on the airfield artificially low as part of an informal agreement with the old Salisbury District Council. They now can no longer accept the losses experiencing since 2007 and have decided to increase the activity on the airfield. The current training contract, which involves teaching batches of Chinese helicopter pilots, is expected to last for 2 years with each trainee pilot needing 290 hours flying experience before they can gain their licence. The training course involves a number of activities which includes periods of hovering in the vicinity of the airfield. More powerful helicopters will be introduced during the training schedule for each batch of pilots as they gain experience; this could lead to a further increase in the noise levels. The PC has been asked by the Chair of the Flying Forum to publicise the procedure for registering a noise complaint - click Advice for registering noise complaints above. The Parish Council and residents meet with Barton Willmore for the long awaited second meeting shortly after revised plans are published on the Wiltshire Council planning website. After several months of delay, the second meeting with Barton Willmore took place with John Glen MP facilitating. Four Cllrs plus 2 residents – one from lower Ford and one from Old Sarum – met with a Director of Barton Willmore, Mark Harris, on Friday 13 May. This meeting took place against the background of some revised drawings and document submitted by the applicant and posted on the Wiltshire Council planning website on 10 May. The meeting was not intended to be an opportunity to consult on any of the changes. Instead, it provided the opportunity for Barton Willmore to cover at top level some of the revisions and offer some information on the concerns raised at the November 2015 meeting. It was clear that there had been some communications between Barton Willmore and Wiltshire Council since this date which had not involved the Parish Council. Click above to read these. It was confirmed at the meeting that the applicant does not envisage offering any further revisions to the original Planning Application. Three of the significant points noted from the latest revisions/handouts are that the total number of dwellings has been reduced by only 10 or 18 (it differs between documents), there is now no intention to hand the airfield over to a trust on completion of the planned development and, in the words of the airfield owner Matthew Hudson, ‘it (the development) is not and never has been a question of viability ever since Core Policy 25 (contained in the Wiltshire Core Strategy) was adopted’. The group of Cllrs and residents that attended the 13 May meeting will be reconvening to identify remaining points that need clarification and to consolidate views on the revisions and the additional data provided at the meeting. Further information will be provided on this website after the group have reconvened. It should be noted, and has been confirmed by Wilshire Council, that the consultation expiry date for the revisions in both letters circulated to a number of consultees and on their planning website is incorrect. The correct date is 9 Jun 2016 as stated on the new green planning notices that have been positioned around the local community within the last few days. The Parish Council meets with Barton Willmore, planning consultants for Old Sarum Airfield Ltd.
On Friday 27 November, 2 Cllrs and 2 residents from the local community met with representatives from Barton Willmore, the new planning consultants appointed by Old Sarum Airfield Ltd. This initial meeting was facilitated and chaired by John Glen MP and provided the opportunity to highlight some of the significant concerns of the local community. It is anticipated that a further meeting will be held in January. The PC expresses concerns and queries regarding some statements recorded within the minutes of the meeting held between Wiltshire Council and the applicant on 21 September 2015 and the subsequent covering letter from Barton Willmore, dated 14 October 2015, which are available on the planning website (4 photographs are included). PC sends Part 2 of 2 to WC objecting to the Application. PC organised an Open Meeting at the Old Sarum Community Centre. The PC outlined its objection to the Planning Application before inviting attendees to highlight and discuss their own thoughts on the Application. Over 110 people attended the meeting with many speaking during the 2hr meeting. PC sends Part 1 of 2 to WC objecting to the Application. Approximately 60 residents attended the regular monthly meeting with several addressing Cllrs on the issue of the Planning Application prior to the start of the formal meeting. Both Mr Hodge and Mr Beal from Old Sarum Airfield attended; the former also addressed Cllrs. During the formal meeting, Cllrs agreed to object to the Application. Application registered with Wiltshire Council. Planning Application 15/04004/OUT for the provision of 22.2 ha of residential land accommodating 480 dwellings and 10 residential hangars has been registered today. Documents are available at the link. Response from WC Principal Conservation Officer to PC email dated 5 Jun 2015. Email response includes confirmation that WC provided comments to the applicants for the planning application on the draft Conservation Area Management Plan in Dec 2014. Also states that it was not acceptable to WC in the form that it had been presented. It indicates that the current draft for which the applicant is the sole author has been submitted as evidence/background papers in support of the planning application submission. This was still considered invalid as at 8 Jun. Email from PC to WC Principal Conservation Officer regarding a Conservation Area Management Plan for Old Sarum. PC raised queries on the requirement for a Conservation Area Management Plan for Old Sarum and the status of the Sep 2014 draft document produced by the applicant for the potential development on Old Sarum Airfield. Response from WC Planning to FOI request. All information covering the last 2 years as requested was withheld by the WC; the reasons given were that pre application submissions were dealt with on a confidential basis/not in the public interest. Two earlier emails were provided. Response from WC Highways to FOI request. No information within the 2 year’s timescale requested has been withheld. Article in Salisbury Journal DEVELOPERS who wish to build at Old Sarum Airfield have been told to re-submit the application after the council told them they were missing "critical information". The planned development of 480 homes was advertised in the Journal on April 16 yet the council were unable to register the invalid application online as it was missing floor plans and elevation drawings. The developers will now be asked to make the necessary amendments before the application is allowed to be submitted. Response from English Heritage (now Historic England) to FOI request. Much data was provided covering the period leading up to and including 2013 as well as 2 letters from 2014. Some information has been withheld as it was deemed not to be in the public interest to release. Due to the volume of material provided it is not practical to include the pre-2014 material on this website. Freedom of Information requests submitted to both WC and English Heritage on 15 Apr 2015. The FOIs ask that copies of correspondence, emails and meeting notes relating to Old Sarum Airfield between both organisations and the promotors of the site, covering the last 2 years, be provided to the PC. PC expresses again the need for a Master Plan to be developed in a partnership with the local community before any planning application is considered by the local authority in accordance with the newly issued Wiltshire Core Strategy. PC also request again access to information from previous consultations between WC and the promoters of the site. Response is helpful but does not address some significant points identified in the PC letter of 30 Jan 2015. PC considering further letter to Dr Brand. Letter sent to Feilden and Mawson, and Old Sarum Airfield Ltd; the letter was copied to Wilshire Council and English Heritage and can be read here. The letter contains the PC’s views on each of the proposed development areas (including traffic issues), highlights the need for a Conservation Area Management Plan (the airfield falls within the Old Sarum Conservation Area), and points out the need to investigate other income streams to enhance the airfield other than housing development. It concludes that the Masterplan as presented on 11/12 Jan would not be supported by the PC. Grenville Hodge advised that they need to progress their proposals quickly so that they can meet their plan to submit the planning application by the end of Jan. They further advised that they would keep the PC informed of any proposals they consider to include in the application. PC advised that discussions were at an early stage currently with a WC Highways Engineer on current traffic issues. The PC would consider the offer again once sufficient progress has been made with the current review. Email received from Grenville Hodge regarding traffic Ford. He was aware that the subject was raised a number of times during the public consultation. He offered the opportunity for the PC to meet his highways consultant Dafydd Rees. The PC met with Old Sarum Airfield Ltd at the airfield on the evening of 11 Dec and received a presentation on the proposed development. The presentation was given by Grenville Hodge, the Director of Old Sarum Airfield Ltd, and 2 representatives of Feilden and Mawson who are the architects for the development. Individual members of the PC attended the Community Consultation on the following day and completed the questionnaire provided. Nine of the ‘boards’ on display at the event can be viewed here. The PC made it clear that it would provide a formal response to what was being proposed which will also be available on the website. 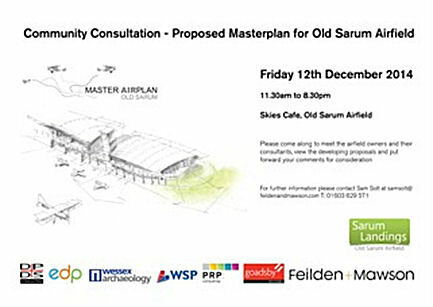 PC agreed, printed and commenced circulation of Flyer to all residents of Ford and Old Sarum encouraging them to attend the Community Consultation day on 12 Dec on proposed Masterplan for Old Sarum Airfield and to express their views on proposed development. Also highlights PC opposition to significant development on airfield and need for Conservation Area Management Plan. PC letter response to 16 Nov letter acknowledging that Old Sarum Airfield Ltd wishes to work with the PC on development of the Airfield and accepting invitation to meet before consultation event in Dec.
Flyer distributed to all residents of Ford and Old Sarum with invitation for 12 Dec 14 to meet Airfield owners and participate in Community Consultation on developing proposals for the Airfield. Letter from Grenville Hodge assuring PC that the Old Sarum Airfield Ltd wish to work with PC in preparing planning application for proposals for Airfield. Also advised of a future public consultation event in Dec and offering to meet with PC. Article provided by concerned resident on 2 fires started on Airfield very close to rear of properties in private housing in Merrifield Road, Ford. Letter to Grenville Hodge states that PC cannot agree with some of the statements made 7 Oct response from Grenville Hodge, 2 examples given. Also refute allegation that PC had alternative agenda for Airfield. Response from Grenville Hodge to PC letter sent on 17 Sep. Many of PC point disputed and doubt cast that PC really wanted to save Old Sarum as active airfield. Also attached summary by Feilden and Mawson on development of Conservation Area Management Plan. Two documents received from Wiltshire Council, both drafted by Feilden and Mawson. Original A11 document received now updated to A12 but now titled ‘Management Plan Old Sarum Airfield. Second draft document is now ‘Conservation Area Management Plan Old Sarum Airfield (D12)’ much larger than document received on 30 Jun 14 (75 pages), content addresses different issues than previous draft. Letter sent to Old Sarum Airfield Ltd stating that PC did not consider draft document (A11) fit for purpose and providing reasons. PC attached detailed comments on the document. Draft of Conservation Area Management Plan for Old Sarum (A11), prepared by Feiden and Mawson, received from Wiltshire Council. Concept Plans for development at Old Sarum Airfield, prepared by Feiden and Mawson, also forwarded to PC by Wiltshire Council.